My number one best piece of advice I ever got was “don’t look sideways, look forward.” It was told to me by a fellow actor before a big audition and she was so right. We have to stay in our own lane, there is room for all of us, no matter what the field is. Becoming obsessed or fixated on other companies and goals doesn’t help me reach mine faster. It’s an important thing to remember and something I repeat constantly. I had the pleasure of interviewing Sas Simon. 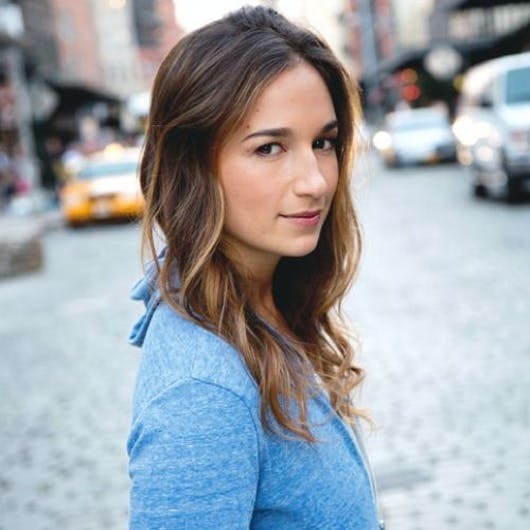 Sas is the Co-Founder of NAME GLO, a contemporary neon design studio located in NYC. 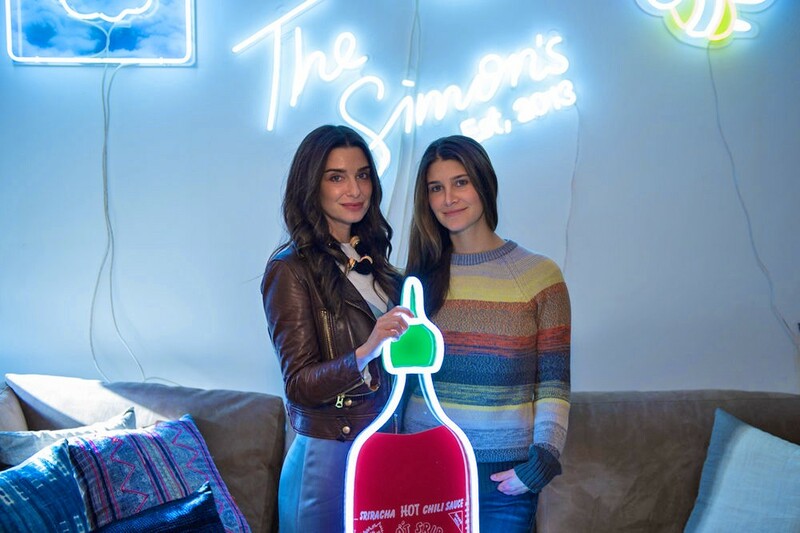 Sas, along with her partner Lena Imamura launched NAME GLO in 2016 in an effort to bring a feminine spin to the bright world of neon. Thank you for having me, thrilled to be included. Backstory is this, I am a born and bred Native New Yorker… one of the few, like I don’t know how to drive, if the commute doesn’t start with a MetroCard I am lost! Anyhow, I am an actress and a writer and a new-ish mom. My partner Lena is also new york born and bred and doesn’t have a driver’s license. She’s an artist, designer and cultural producer, who’s had many lives working in the art world, music industry, tech, and — don’t ask why — but has a lot of experience with accounting and business management. Together we’re quite the yin and yang team! The inception of NAME GLO began when my nephew was born. I was desperate to get him a neon sign as a “welcome to the world” gift and was frustrated by the lack of options and information I found. I had searched all that the internet and NYC had to offer and couldn’t find the right place, with the right design, for the right price. After a lot of unsuccessful googling, I turned to a friend who was also a neon artist to commission the piece, enter my now partner in crime, Lena Imamura. We both felt there should be an option for a simple, fun and easy way to get a neon and we set forth to create a contemporary, hip, neon experience — and here we are today! We are thrilled to be lighting up New York and beyond, and bringing our signature glo to everyone. The world of neon is way smaller than I had anticipated and as I began my search, I realized it was mostly male dominated and quite esoteric. There was already an assumption when I reached out to certain vendors that I knew what neon was and had an idea of the production and pricing structure… which obviously I didn’t. I was also getting prices that were astronomical and all over the map and the websites all looked like they were from the 90s and no one responded to me for days, sometimes weeks! 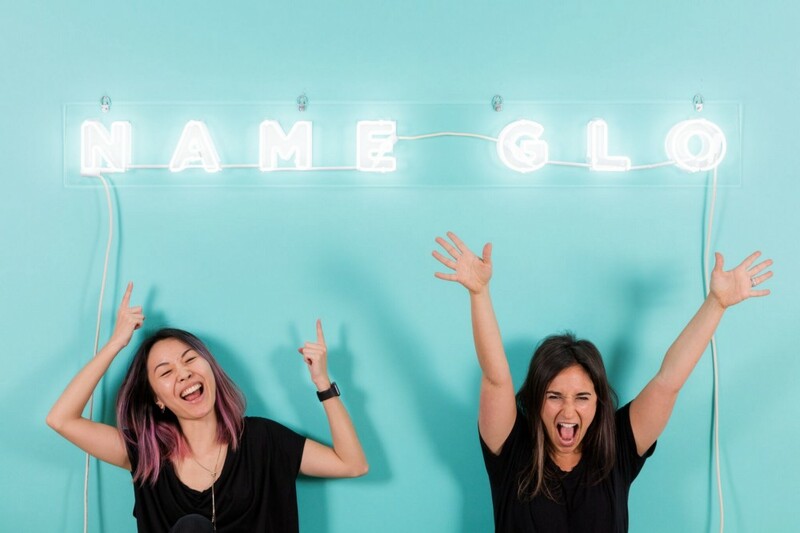 So when Lena and I set out to start NAME GLO, we wanted to offer the exact opposite experience for our potential clients so that neon could be made accessible to more people — -get rid of the mansplaining, eliminate the confusion, innovate into the 21st century, and make the experience inclusive. We hope we’ve created a neon experience that does just that! As digital natives who grew up with the internet, our natural platform of choice was to create an e-commerce website and build a design app — a web-first approach was very unusual for the neon industry when we launched. Our friendly designs and feminine perspective aimed to take neon out of dark bars and casinos and into bright homes and parties . We walk clients through the entire process from A to Z, no question is ever silly or obvious. We’re taking an idea you have in your head and making it into neon — that’s not something you do everyday — — we get it! Neon is an investment and we want people to know we care how it all turns out! In addition to classic glass neon, we also offer something called LED neon that has a similar vibe as neon but it’s not glass nor gas. Were able to offer this at a lower price point, and makes it more accessible, due to its durability, and easier to ship! At every turn, we are looking at how things have been done before and see where we can innovate the industry today — — and we’re just getting started. So many mentors of course, but first and foremost my parents. They are both super hardworking and taught me that if I put my head down and do the work, it will yield results. They also have always supported all my endeavors. You can imagine they were shocked when their actor daughter, told them she was co-creating a neon company, but like they have done before, they welcomed my new ambition with open arms. I also grew up in a female operated theater company where I got the base of my training, watching Audrey Kaplan pursue her dreams of owning a training ground for young actors certainly made me feel like I could follow my dreams as well. Lena’s parents are also large influences on her work-ethic and colorful background experience. She works with a life coach who’s had an incredible impact on her. And she also has a handful of mentors who are experts in their fields like Tamiko Benjamin, Sue Choe, Jamie Kim, and Beth Viner, who have immensely helped us in our journey with their wisdom and support in operations, people matters, mental resilience, and brand strategy respectively. We love getting to know the other neon designers and makers out there — — especially the female artists who are making their way, the world is mighty but it’s small so becoming familiar with their work is super inspiring. We have a few plans for 2020 and beyond that I can’t totally talk about yet, but let’s just say I am shaking in my boots with excitement for what we are cooking up. We are dreaming big baby. We also have a few products about to launch that I think will only add to our brand. More than anything we want people to think about neon differently. The beer and “open” signs of the past are yesteryear. 1) My number one best piece of advice I ever got was “don’t look sideways, look forward.” It was told to me by a fellow actor before a big audition and she was so right. We have to stay in our own lane, there is room for all of us, no matter what the field is. Becoming obsessed or fixated on other companies and goals doesn’t help me reach mine faster. It’s an important thing to remember and something I repeat constantly. 2) Laugh at yourself. This is my dads mantra. Don’t take it all too seriously, and find the funny. Always find the funny. 3) Lastly, have an abundance mindset” — — limiting your mindset is limiting your life. There’s no need to be a scrooge, live exponentially, tip generously, be nice, the world needs more kindness and generosity. This question is making me feel like I don’t listen to NEARLY enough podcasts, thanks for reminding me of that. The last book that had me really thinking was Jessi Klein’s “You’ll Grow Out Of It.” She gave me such a fresh spin on mastering or not mastering adulthood. She also had me howling with laughter. Lena is obsessed with podcasts and is an avid reader (like a book a month)! She listens to everything and anything in the personal growth and metaphysical space. One influential idea that she always comes back to is Simon Sinek’s “Start with Why” concept. Knowing why you do something, your purpose, is what’s going to get you to your goals — — not the results you’re after. Feel free to give Michelle Obama my number, would love to chat with you Michelle, grab a bite maybe? She is the ultimate queen of bringing a job/role into the 21st century, she completely modernized my idea of a First Lady. I am inspired by the work she does and her commitment to changing the world. Diane Keaton for sure. I have been in love with her since I was a tot, just sitting next to her… or like 50 feet away from her would be enough for me. She feels like a woman who is completely comfortable in her own skin and has never wavered in that for any role, producer or job. KEATON FOR PRESIDENT. Speaking of VCs — — we are inspired by Kirsten Green who invests in companies who “rewrite the rules of culture.” We aspire to do just that and would love to hear any advice or insights into the future of culture as she sees it. Also, Anu Duggal who believes that women make better entrepreneurs and ought to be supported for it — — we would kill to hear stories of how/why women succeed better as entrepreneurs and what advice she may have for us in our journey. Please follow us @NAMEGLO to check out our latest neon endeavors. 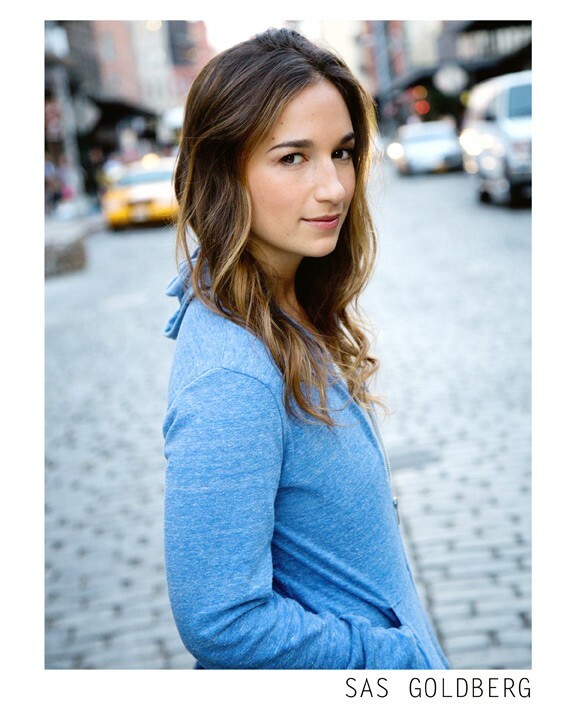 And my personal instagram is @sasgoldie, but fair warning it’s a lot of self deprecating mom humor and photos of me crying watching reality T.V…. don’t say I didn’t warn you! If you want to see Lena’s creative life you should 100% follow her @i_leonard!